Got leftover curry paste or coconut milk from another recipe? 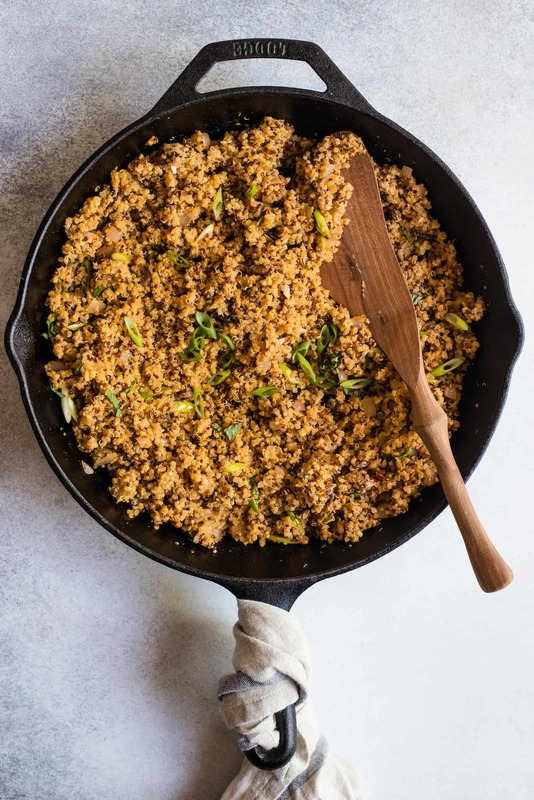 Use it to make this red curry quinoa! 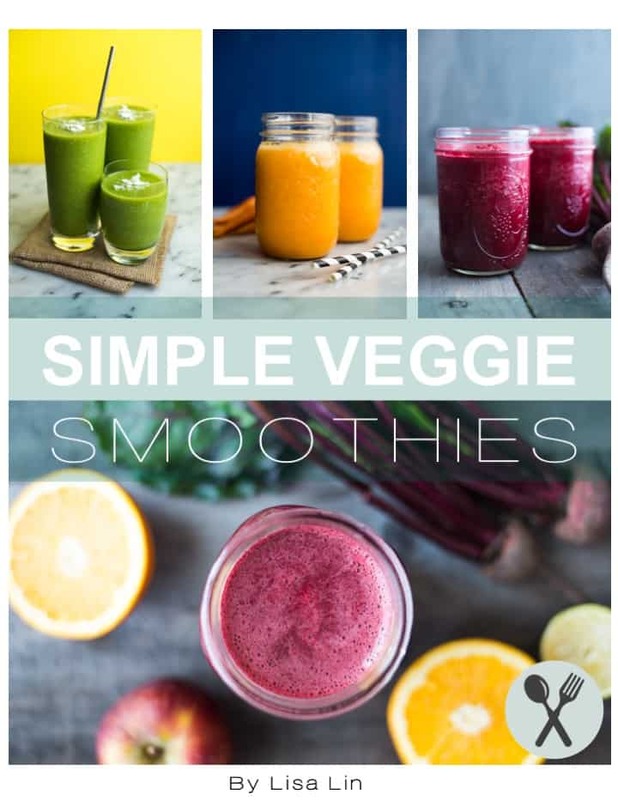 It’s a very simple dish and you can pair it with your favorite protein and vegetables! When ask my friends what’s their biggest pet peeve with recipes, most of them say that they hate buying ingredients that they’ll only use once. For example, they might find a recipe that requires capers, but after they cook that recipe, they don’t know how else to use the ingredients. I sympathize with them completely. That’s why I want to start a new series called “Leftovers,” where I create recipes based on leftover ingredients I have in the house! A few weeks ago, I developed this green curry chicken with zucchini noodles recipe and I had a lot of coconut milk left in the refrigerator. I was curious to see if I could use similar flavors for to flavor quinoa and it works surprisingly well. Honestly, it’s some of the best quinoa I’ve had in a while. The first time I made the curried quinoa, I used green curry paste and added a few sliced Thai chilis, which made the quinoa quite spicy. Fortunately, I was in the mood for spice, but I dialed down the spice for the final version of the recipe. 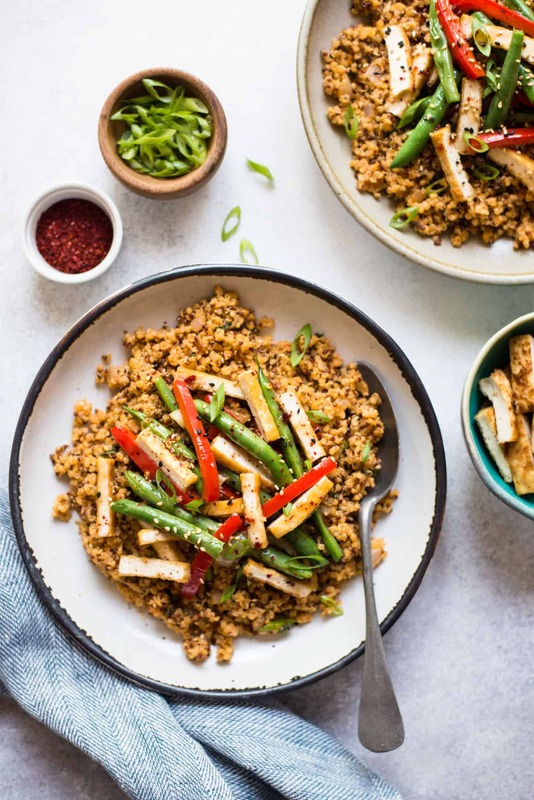 I’m pairing the quinoa with a honey chili tofu stir fry, but it goes well with anything! 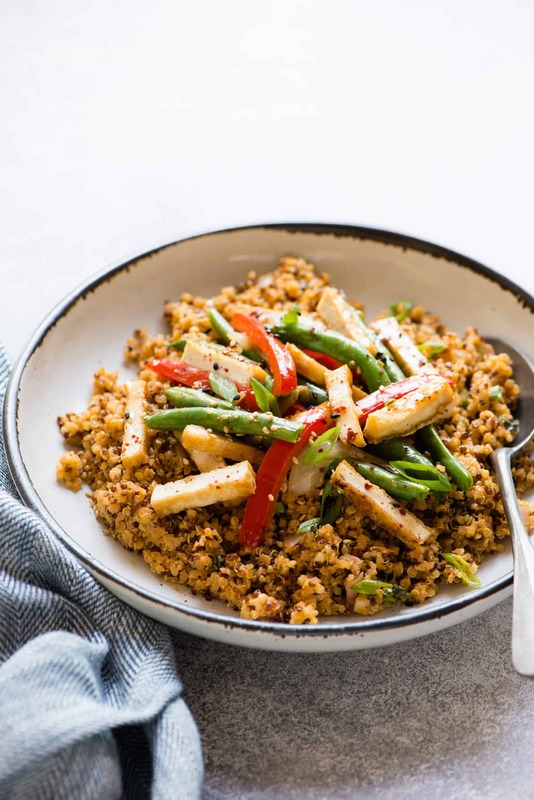 Make it a meal: You can also pair the red curry quinoa with my Cajun-Spiced Grilled Tofu, Honey Chili Garlic Shrimp or Kung Pao Tofu Stir Fry! Got more red curry paste? 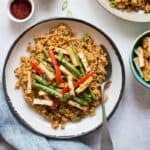 Try these recipes: Easy Coconut Curry Stir Fry Noodles with Tofu, Red Curry and Brown Sugar Tofu Spring Rolls, One Pot Curry Noodles. Got more coconut milk? Try these recipes: Yellow Curry Noodles with Shrimp, Vegan Tomato Soup, Curry Laksa with Tofu. Drain the tofu and wrap it around 1 or 2 sheets of paper towels. Place the tofu on a plate and press it down with a stack of plates. Leave the tofu there for about 30 minutes. Heat the olive oil in a large sauté pan over medium-high heat. Add the shallots and cook for about 2 minutes, until they start to soften. Add the garlic and ginger and cook for about 30 seconds, until fragrant. Add the salt and curry paste and stir to incorporate. Pour the quinoa into the pan and stir to mix the curry paste with the quinoa. Add the coconut milk, lime juice, scallions and thai basil to the pan and stir. Turn off the heat and cover with a lid as you cook the tofu. Cut the block of pressed tofu into 6 slices along the length of the tofu block. Add 1 1/2 tablespoons of olive oil to a pan over medium-high heat, and pan fry the tofu for about 8 minutes, flipping halfway through. Sprinkle 1/2 teaspoon of salt on the tofu. Transfer the tofu to a plate. Once they are cool enough to handle, cut each slice into small strips. Add another tablespoon of oil to the pan to sauté the vegetables over medium-high. Add the green beans and peppers to the pan and cook for about 5 minutes. Season with a pinch of salt and add the tofu strips back to the pan. Add 1 1/2 tablespoons of honey chili sauce and stir with the vegetables and tofu. Turn off the heat and serve with the red curry quinoa. If you are working with uncooked quinoa, bring 1 cup of quinoa and 2 cups of water to boil in a medium saucepan. Reduce the heat to low, cover the saucepan, and let the quinoa simmer for about 15 to 18 minutes, until all the liquids have absorbed. Turn off the heat. Keep the lid on the saucepan and let the quinoa sit for 20 minutes for the quinoa to fluff up. You should now have about 4 cups of cooked quinoa. 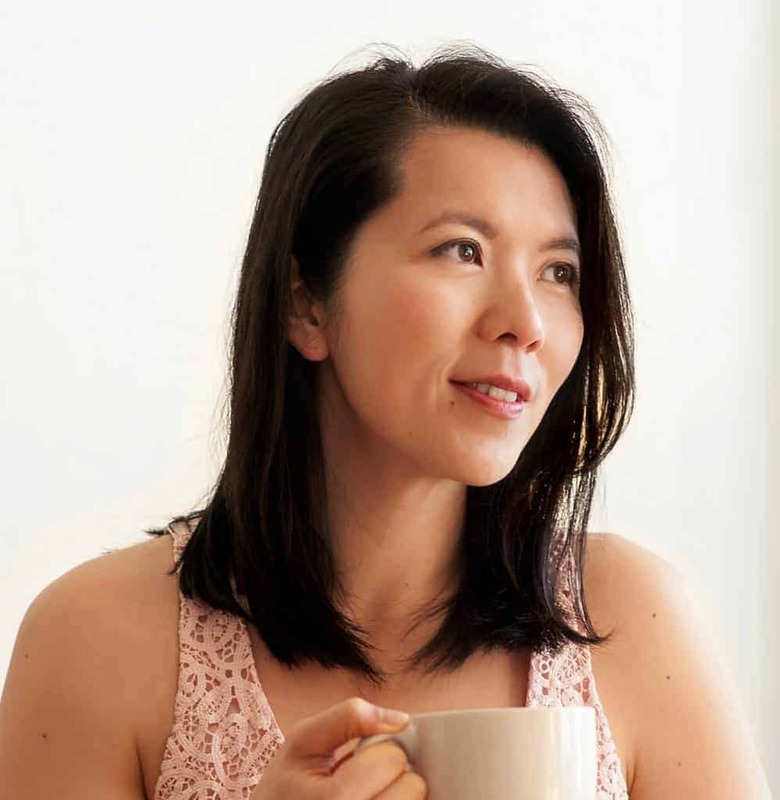 I’m always curious what makes people turn away from a recipe, too, and I’ve heard the same thing – uncommon ingredients that can’t be applied to many other recipes, and/or too many ingredients. I’m LOVING this series! I often end up with a partial amount of some sort of ingredient and I hate when it ends up going to waste. Also, this red curry quinoa looks amazing. This stir fry looks AMAZING! I recently discovered red curry paste and I can’t get enough! So excited to use it in this recipe!